April 16, 2019 By Aileen Leave a Comment This post contains affiliate links. As an Amazon Associate and member of other affiliate programs, I earn from qualifying purchases. 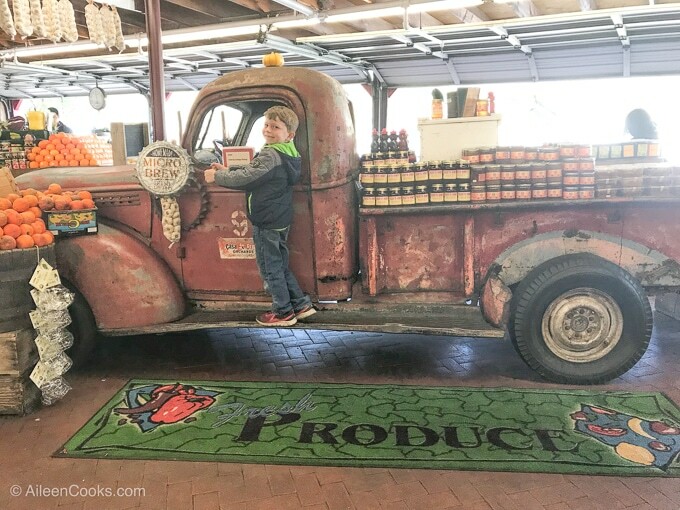 Read this review before visiting Casa de Fruta. We cover everything you should hit while in the area! 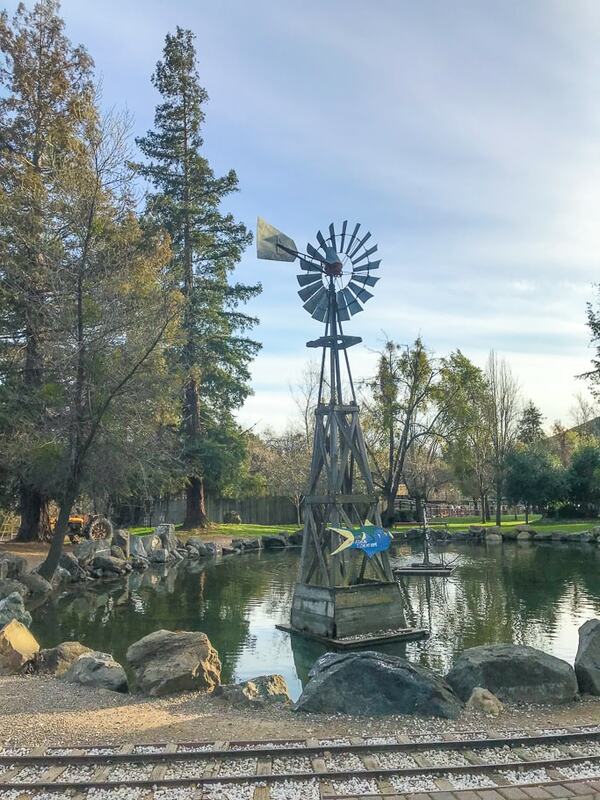 We spent a weekend in February camping at Casa de Fruta. If you have never heard of it, it’s a little town (shopping area? destination?) built around a fruit stand that was started over 100 years ago by an Italian immigrant family. Since then, they have opened many other businesses all with similar names: Casa de Sweets, Casa de Wine, etc. We stayed in their RV Resort and camped in our pull-behind trailer. The RV resort offers full-hookups, which was perfect for us. We camped at the top lot, near the clubhouse. We were with a large group and had the clubhouse reserved for the weekend. It was perfect for group meals as there were lots of tables and chairs along with many electrical outlets. Since it was February, it was a little chilly (for Californians), so our kids were able to play in the clubhouse during the day when they got cold. It was also nice and flat so our kids were able to ride their bikes up and down the road next to our trailer during the day. Their camping area also has a pool and laundry. Laundry is a must for us at this current junction of potty training so I was relieved to see they had that option should we need it. 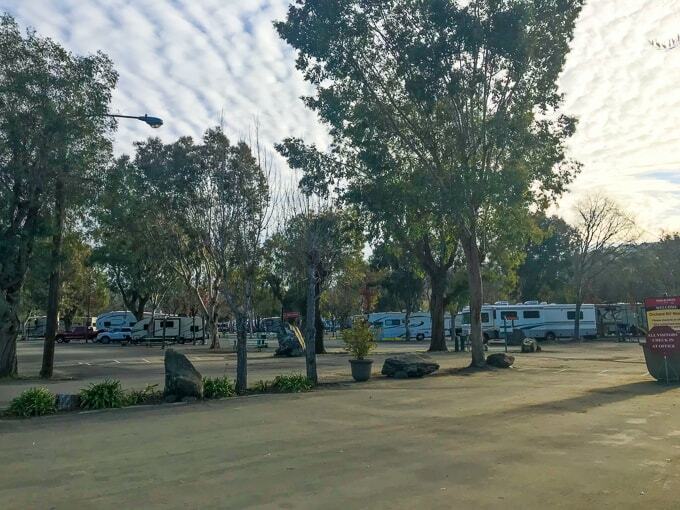 The RV Resort includes Cable TV hookups and also offers tent sites. They host the Northern California Renaissance Faire every year, which sounds like so much fun. I would imagine it’s reminiscent of Medieval Times but more hands-on. This is also a great place to stay if visiting for the Garlic Festival in Gilroy. The spots where we camped were mostly parking-lot camping. There is another camping area closer to the water that is grassy. It seemed to be closed for the season (I am assuming it’s a flood zone). I had the opportunity to spend Sunday morning walking through the water-front campsites and it was absolutely beautiful. I would describe it as serene. Although Casa de Fruta is close to the freeway, I could not hear it at all from the water-front area. There were many opportunities to bird watch and cows grazing on the hills nearby. I would worry about camping with little ones at the water-front spots. You would need to be mindful of them and possibly just keep them in a lifejacket during the day. Maybe that’s overkill? I haven’t actually camped in those spots, so I couldn’t say for sure. I don’t have personal experience with their hotel, but they do offer accommodations at Casa de Inn. They offer a AAA discount and also have a pool. It’s located right next to the other attractions, so it’s in a good spot. We really enjoyed our weekend at Casa de Fruta because there was a lot to do for families. They had an old-school playground at the campsite with a big metal slide. My kids loved it and even my two-year-old went down it several times. It is fast so I had to catch her. There was a nice walking trail that took you to the Casa de Fruta fruit stand – they thing that started it all. The fruit stand is huge and they carry not only a ton of different types of produce, but they carry many different snacks like beef jerky and flavored nuts. Near the fruit stand is Casa de Amusement. 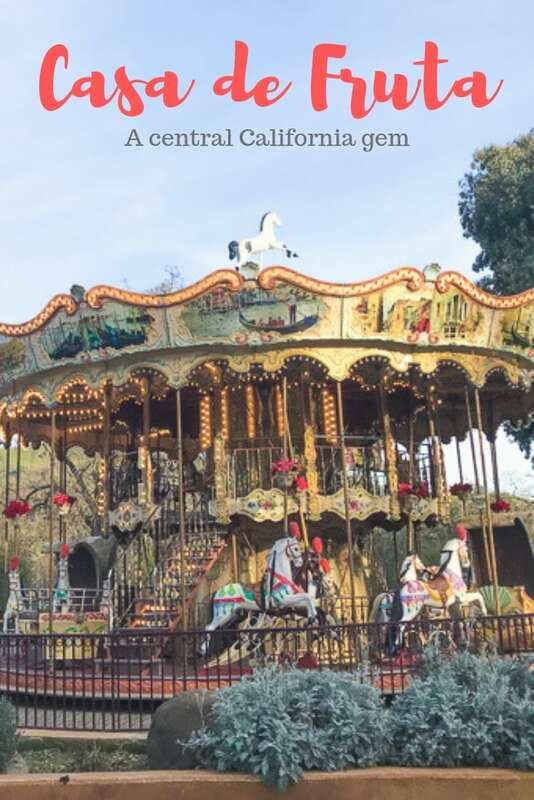 It features a great park, a train ride, a two-story carousel, and a duck pond. 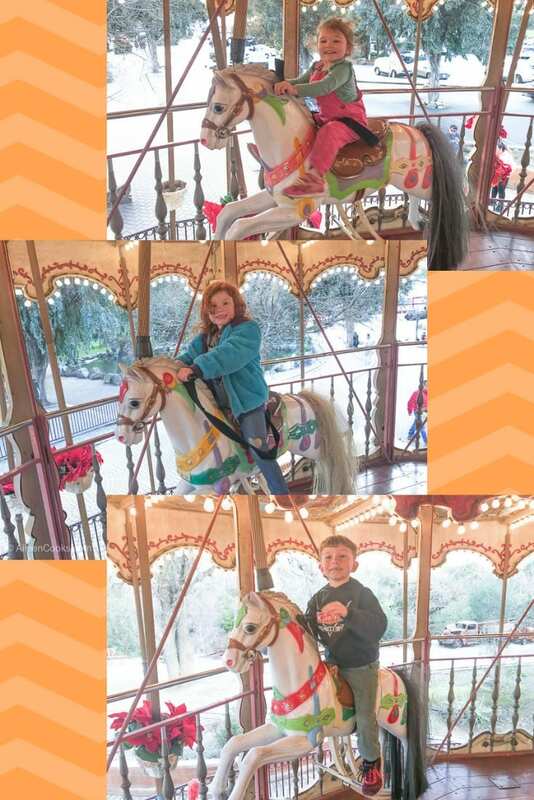 My kids loved the carousel the most. Riding on the second story is a lot of fun and isn’t much money to ride. You also don’t want to miss Casa de Sweets. We had the ice cream and it was delicious. They are also a full-on candy store and fudge shop. It reminded me a little of the candy store we visited in Carmel but bigger. One of the cutest things about visiting Casa de Fruta is all of the matching names: Casa de Amusement, Casa de Wine, Casa de Restaurant, etc. The area is all themed. It really is a special gem that you should see for yourself – even if you are just passing through. It’s definitely a day-trip or weekend kind of place. 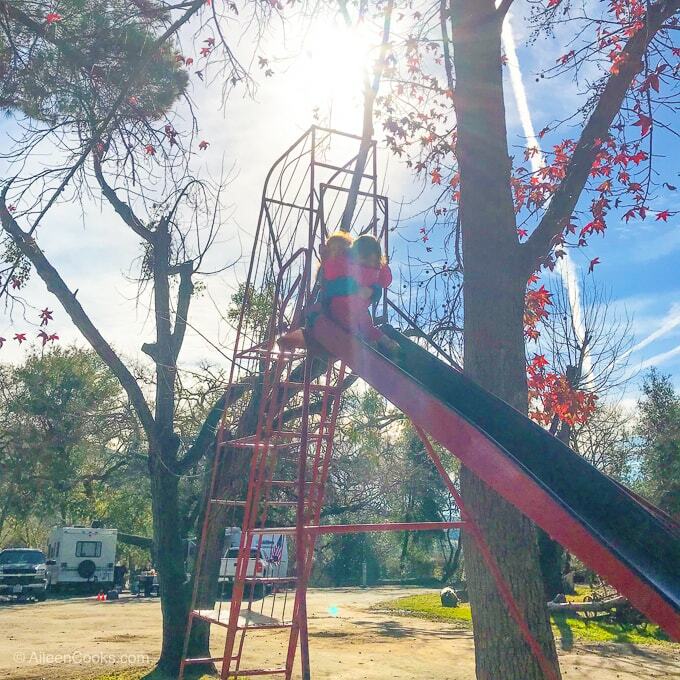 You may get bored if you spend much more time camping at Casa de Fruta. It reminded me a lot of the KOA in Petaluma. There was a lot of activities for the kids, but you wouldn’t want to spend much more than a weekend. Overall, we enjoyed our trip to Casa de Fruta and would visit again. I would recommend visiting in the milder months as I’m sure it gets rather hot in the summer.